Our Red Haven peaches are doing well in spite of the fact we did not spray them this year. The fruit is not large, but these small tress produce an abundant crop. Click on the image for a larger view. 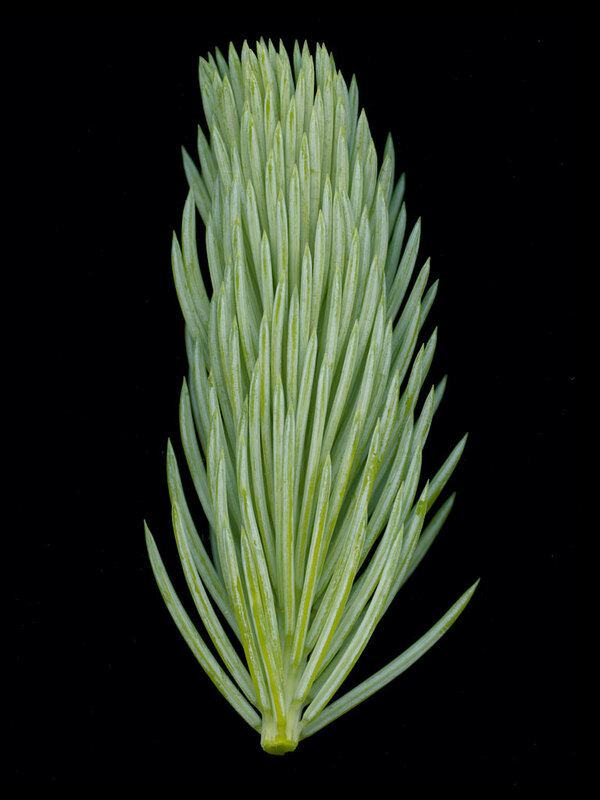 Blue spruce, picea pungens, is native to the Rocky Mountains, but can be found as ornamental trees throughout the United States. 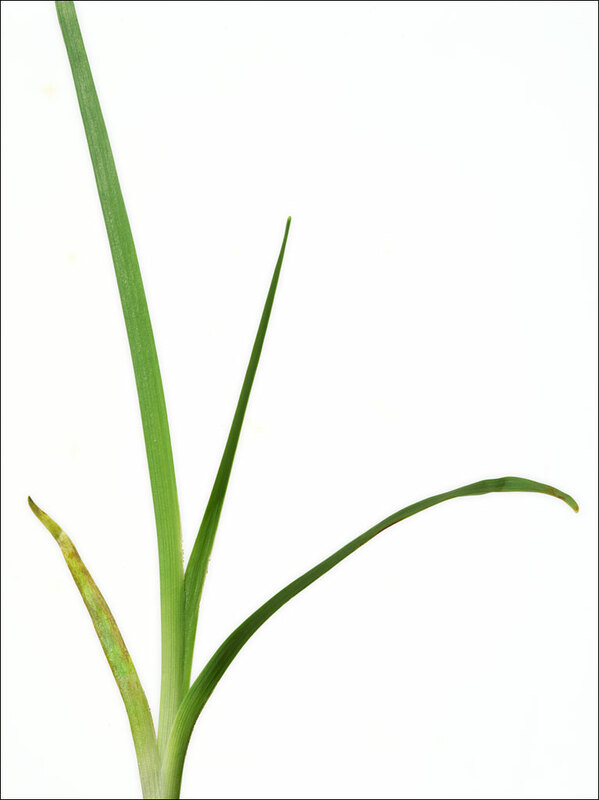 The young shoots can be used to make tea high in vitamin C. This bitter, resinous drink is surprisingly refreshing, although it is not uncommon for people to add a sweetener. Click on the image for a larger view. Spring is such an amazing time of year. 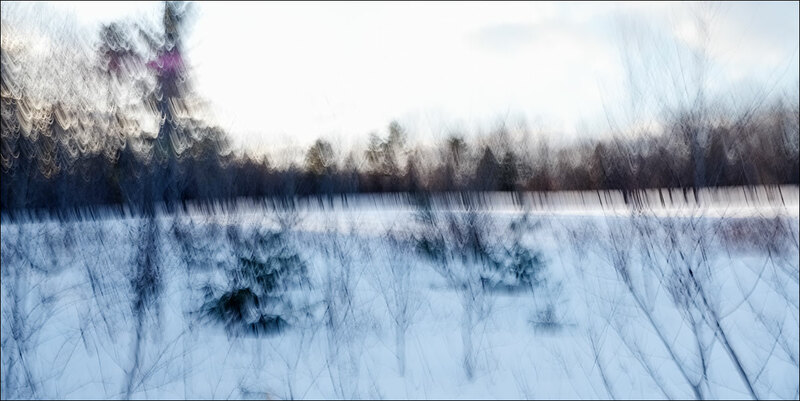 We have had months of a dry, brown landscape, and then, within a matter of weeks, the landscape transforms. After two days of rain, there was a break in the weather this evening. 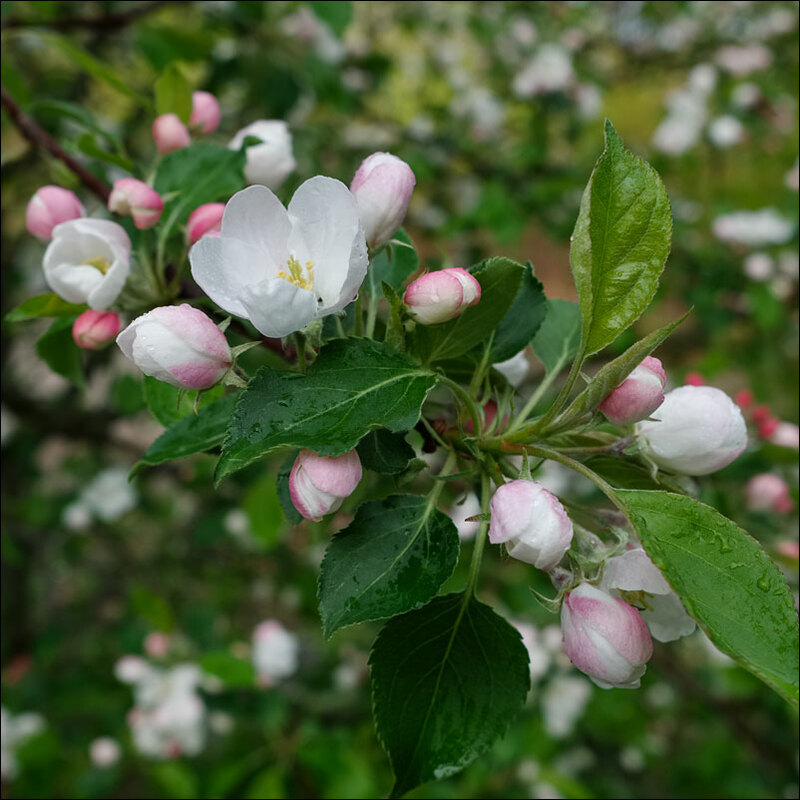 I went out to see our sweet crab apple tree. 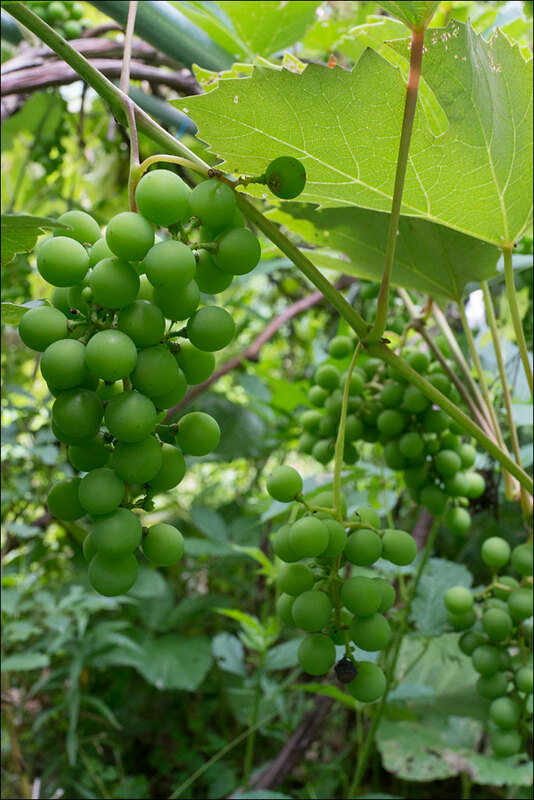 Not only do we enjoy its magnificent spring display, in the late summer, we can also harvest its fruit. Click on the image for a larger view. Our daylilies are emerging. While the daylily (hemerocallis fulva) is known as a decorative plant, it is also edible. This time of year we eat the young shoots by stir frying them in soy sauce and serving them on tofu. We harvest the shoots when they are only a few inches long. The ones pictured here would be a little too old. Click on the image for a larger view. The field where we grow our blackberries has a hardness in winter that is hard to describe. It is not barren, Rather it has lost an intimacy with its visitors. A place to pass through, offering little cause to linger. Click on the image for a larger view. 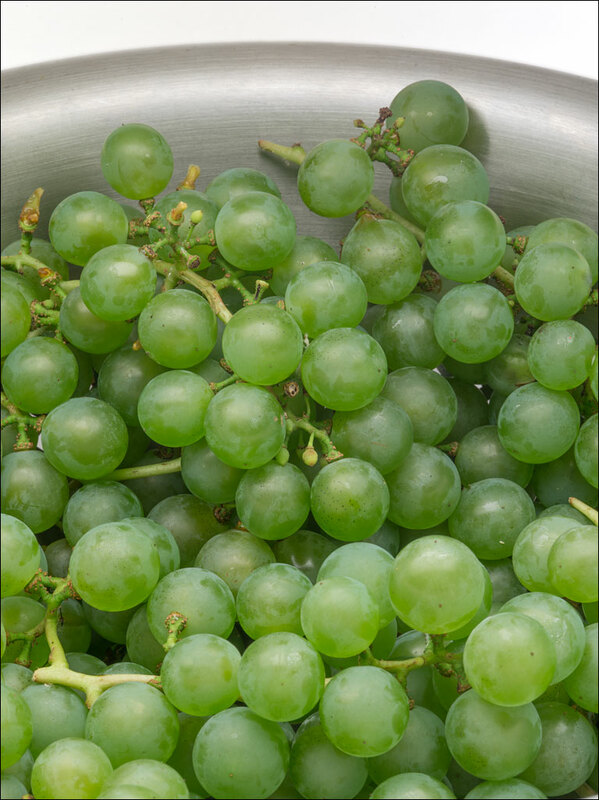 We harvested the last of this year’s grapes yesterday—three large bowls of fruit. We had been enjoying our grapes for the last three weeks. But with evening temperatures dropping, it was time to finish. These are entirely organic, no pesticides are used to protect them. We lose a few fruit to insects, more to birds, but plenty are left for us. Click on the image for a larger view. August always takes us by surprise. 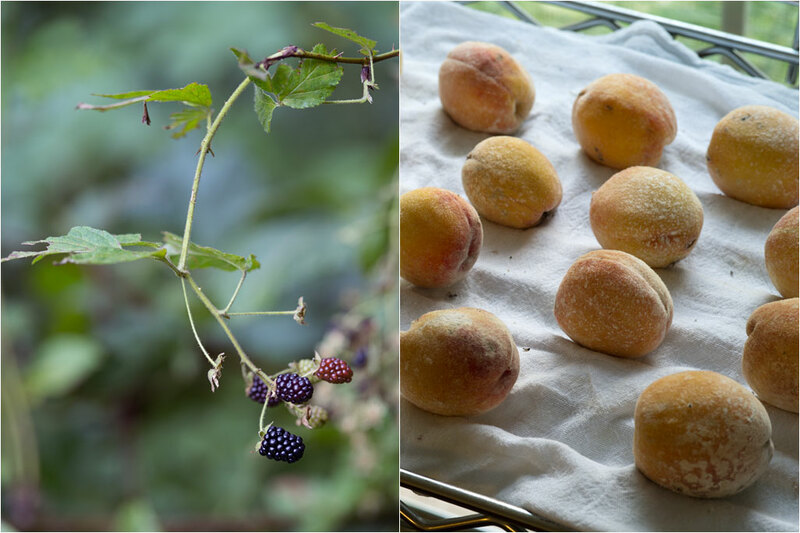 The glut of food is wonderful, but adds more time than we anticipate on top of our other tasks—we spend a couple of hours in the evening just keeping up with the ripening blackberries. It is not something we can exactly put off. Still, once outside, the act of gathering this fruit becomes its own meditation. That other hectic life at the office dissipates and is replaced by the cycles of the planet. This symbiosis, which is, at one level, indifferent and, at another, dependent, is a great performance we all part of. Click on the image for a larger view. 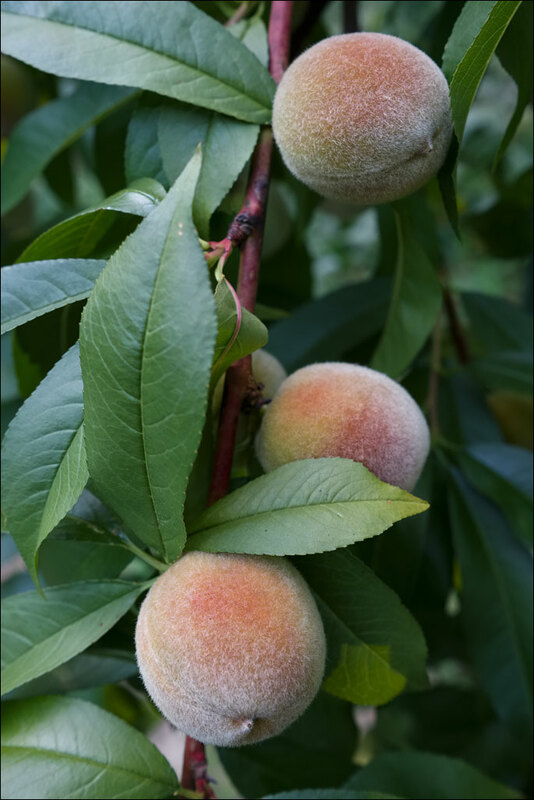 Our peaches are starting to ripen. Red Haven do not produce a large fruit, about 2″ or 5 cm in diameter, but it does produce a large crop. They have a smooth peach flavor with a hint of lemon. 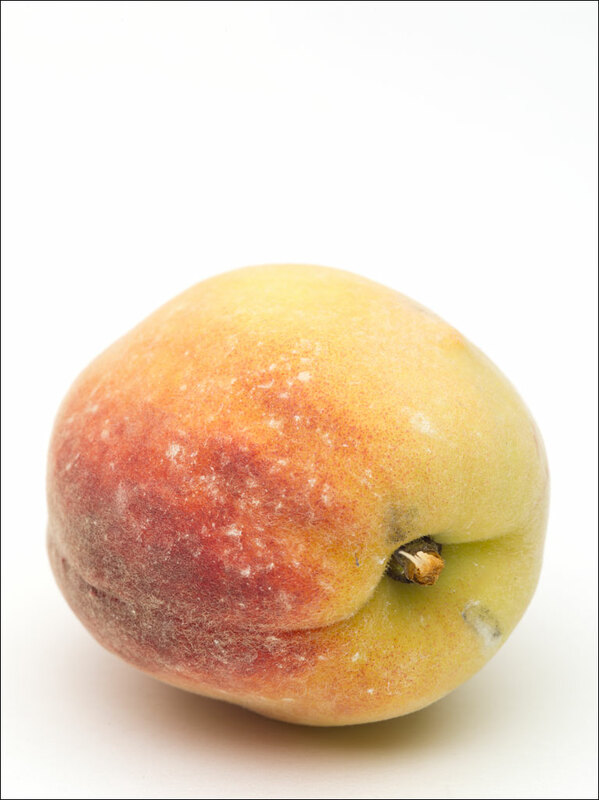 Except for Surround, a kaolin clay based spray, the white spots on the fruit, our peaches grow without protection. Click on the image for a larger view. It is blackberry season again. This is our largest fruit crop of the year—we are just finishing up the blackberries we picked last year. 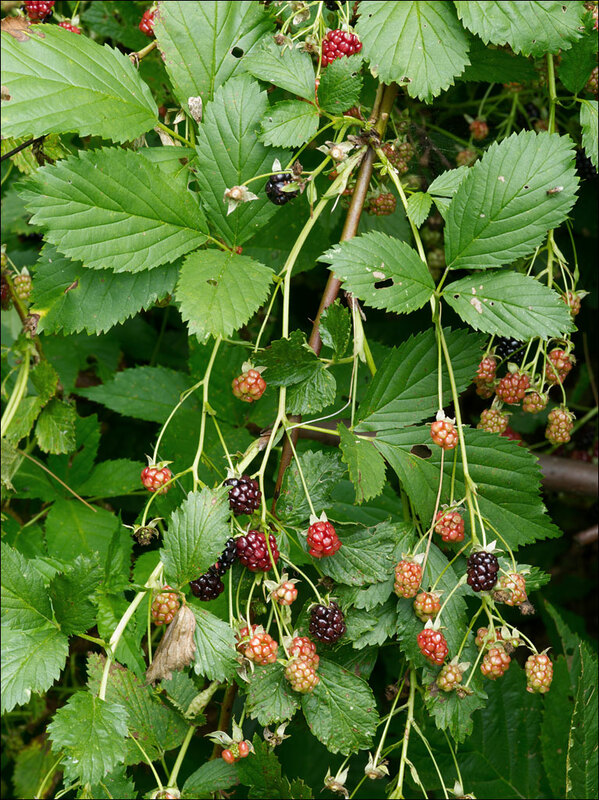 We will spend August gathering these berries. Click on the image for a larger view. Our grapes have done very well this year. If the birds do not get them, we should have a very good harvest. Still a little early for humans to consume, but here’s keeping our fingers crossed. Click on the image for a larger view.